– Lisa, you are an author, editor and tutor. Therefore, books, literature, writing, tutoring, editing, publishing, distributing, all this makes the major part of your professional life. Would you call the World of Books and Literature also your major passion? – I am passionate about the telling of stories – not only in the written form but also in film and theatre, so not exclusively books. I am passionate about stories because they are ultimately the way we share experiences, gain understanding and insight and, hopefully, laugh, learn, see new places, meet characters we recognise and perhaps cry a little on the way. Stories not only provide entertainment but they often reassure us that we are not alone. – One pen, one book, one teacher, can change the world, said Malala Yousafzai some weeks ago when nominated for the Nobel Peace Prize. Literature is indeed a strong medium, always was, always will be. Do you believe so too? Why? – When a book or a paragraph or a spoken sentence resonates with something in your life or touches you in some way it can have the most profound effect. Words are our means of communicating and stories are our way of showing that we are made of the same stuff – only the little cultural things differ. I’m not sure that one writer, one book or one teacher can change the world but it can certainly have an impact. What writers do is mirror the world that is around them to show to the rest of the world. That is what I believe is the writer’s job. – Your first degree was in Russian Language and Literature with Portuguese as a subsidiary. What fascinated you most about Russian Literature? – I sat up one night freezing cold alone in an apartment in Dankelmannstr in West Berlin in 1984 and read Crime and Punishment. There were uncanny resemblances between Saint Petersburg and Berlin and the question resonated: was Raskolnikov right to murder the pawnbroker? Words of Brecht echoed in my ears, ‘What meanness would you not commit if at last you could change the world?’ West Berlin in the eighties was full of anarchists, artists, musicians, writers, pacifists, hippies, freaks, punks, Brits, Americans, French, Turkish, many of them wanting to change the world. Then just over the Wall there existed another world – a world without pawnbrokers. But then there was the problem of the innocent Lisaveta who he has to murder along with the pawnbroker and the fact that Raskolnikov couldn’t live with the guilt. The story resonated – with my life and with the world I lived in. Dostoevsky had mirrored the society of his time – and it was and is still relevant. I became fascinated with Dostoevsky and Russia, as well as the whole Communism versus Capitalism debate. The Russian affair was sealed when I took the Trans-Siberian train from Beijing to Berlin five years later in the winter of 1988. It was a scene from Doctor Zhivago – even the wolves seemed to howl at night in the tundra and the soldiers marched through the carriages and shook us awake demanding to see identity. – Having lived in Russia and Berlin, at historical moments in history, you have experienced the difference between daily life in the presence of the iron curtain, and later with the lightness of spring air of Perestroika. Can you tell us some of your significant memories of that time? I stayed in the Soviet Union and the in-between country when no one seemed to know what was happening between 1988 and 1993. But there was never spring in the air. One time I stayed for months in one of the Soviet pre-fabricated cardboard apartment blocks that the Muscovites used to joke that they would fall over if you leaned too hard against them. It was misery. I even spent hours trying to get into the apartment I lived and only realised I was in the wrong block when a babushka started shouting at me. A bottle of Russian Brut champagne was cheaper than a tomato. The average Soviet citizen could afford almost nothing which was just as well as the State shops were empty anyway. Within months of the collapse of the Soviet Union a new Mafia was born and began to carve up one of the richest organisations of the world. Crime rose. I was on the Metro one night when I saw young men strategically line up along the platform. When the train pulled in I didn’t get on but I saw the men pull out knives. I don’t know what happened then. It was never reported. I have written about some of my experiences in the Soviet Union during this time in a novel, The Extraordinary Tale of Comrade Rublov, but it has only ever been published as an ebook. – Your novel, The Last Dance over the Berlin Wall, published in 2009. tells the story of a young artistic dancer, Johnny East, who is looking for a new direction in dance. He finds his inspiration in East Berlin at the circus. Where did you get the inspiration from? 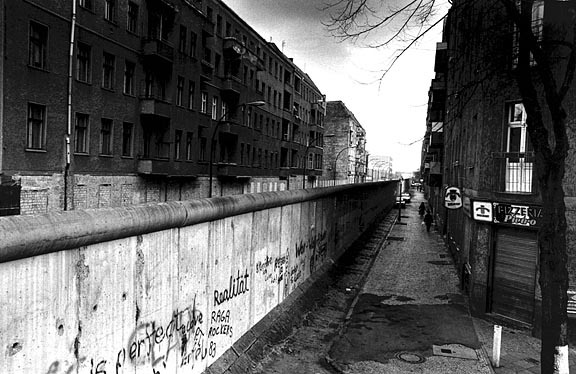 – I had a friend in West Berlin with an apartment that overlooked the Wall in Neukoln. I often found myself gazing across. It was a narrow part of the Wall. The building on the other side was bricked up on the first floor but the rest of the apartment block was lived in. Then in the East I made friends with a guy who also lived near the wall (a little like Bodo in the novel) and he really did give me an old Bakelite phone telling me he’d been waiting ten years for it to be connected. We usually had to talk over music as he was sure his apartment was bugged – which given the Stasi revelations it probably was. These images were strong in my mind when I started planning the novel. It needed to be extraordinary like Berlin at that time. I have always been interested in dance and one of my best friends in Berlin at that time was a dancer. I started thinking about the possibility of a high-wire crossing of the Wall. I began my research. It was possible. Philippe Petit had crossed the Twin Towers on a high wire. When the Wall first went up it had been done. What’s more: the apartment block near the Wall that I chose was later that year demolished. So I had my story. A love story in a time when the two sides were not allowed to meet and a daring escape. – You lived in Berlin 1984/1985. You describe Berlin as a very special place in a very special time. Have you ever been to Berlin since then, and if yes, how do you look at Berlin today? I went back twice while researching the novel. Of course the city has changed but I can still feel the old Berlin in the back streets of Kreuzberg – and in the parks and open spaces. It is as if Berlin is wearing a different dress and lots of make-up: one that is much finer and fancier but take off the dress and the city is not so different. It is perhaps the only city I would go back to live in. – You chose to live in Portugal around ten years ago. What made you choose the mountains of Monchique, the other side of the mountains as people here say, instead of living at the coast? My father came to visit me when we first moved here. I took him to a party down the road. There was live music, people warming their hands and wine around fires in oil drums, other people smoking, someone reciting poetry. They were anarchists, artists, musicians, writers, pacifists, hippies, freaks, punks, Brits, Americans, French, Germans, Portuguese, Americans, Dutch, Brazilians, Angolans. My father looked around, held up his Sagres and said, ‘I don’t bloody believe it! This is Berlin. Twenty years on.’ Of course it wasn’t. But he had a point. Like Berlin at that time, the mountains do attract a different type of people – people who want to live a slightly different life – away from the mainstream. The coast is more conservative and, of course, more expensive. – Does the “Serra” inspire you? Why? The way of life of the people here and the people themselves inspire me. It is a world which is fastly disappearing. Many of my neighbours belong to the last generation who will cultivate the land, keep donkeys, chickens, pigs, make medronho. Most are illiterate and yet they have such an impressive knowledge of the land passed down from generation to generation – without books but with lots of stories. When I came here there were four such families living like this in the hamlet I live in. Now there is one – a couple who farm the land, make medronho, sell their produce at the market in Monchique. They don’t drive, don’t read, don’t write. They are the last of a kind. – In 2008 you edited and published a collection of stories from seventeen authors living in the Algarve, or who had some connection with the Algarve, called Summer Times in the Algarve. Then in 2010 you wrote, edited and published a collection called Beyond the Sea, Stories from the Algarve, which includes several interlinking stories about people living in the Algarve, both locals and foreigners. Beyond the Sea is translated and edited in German as well as in Portuguese with Montanha Books. What made you decide to initiate an editing and publishing service? – As a writer I’m very interested in place. It is one of my first inspirations. There seemed to be a gap in the market for books about Portugal and, in particular, the Algarve. At least books written in English – other than Monika Ali’s evocative Alentejo Blue there are not – or there weren’t in 2008 – that many books that opened a window onto the province. I thought it was a gap that needed to be filled. I wanted to show the Algarve as being much more than a tourist destination for golfers and sun, sea and sand seekers. I also thought that as an independent writer/publisher it would be easier to control distribution. – Amazon is a huge distributor. Is it difficult to enter this kind of market for a single publishing author? What are your experiences with big and small distributers? – Amazon is fantastic. Anyone can publish and sell on Amazon. It has opened many doors for writers. It has provided an equal playing field – almost. It still helps to invest money in getting reviews and marketing in general so those with money are able to make more of a splash. Nevertheless it has given writers a chance – particularly with Kindle. Sadly, most of the independent bookstores in the Algarve have closed down and it is almost impossible to get into the big stores such as Bertrand’s or FNAC – unless you are a publishing company with a turnover of 20,000 plus pounds/euros. – Apart from being an author and tutor teaching Creative Writing Online courses for the continuing Education Departments of the University of East Anglia, University of York, and Oxford University, you do occasionally edit and publish authors who live or write about Portugal/Algarve under Montanha Books. Your newest publication is Janice Russell’s An Algarve Affair, which will be presented soon, on December 17th, at Quinta dos Vales in Estombar. Without telling too much about the story, what made you decide that this was a book you wanted to edit and publish by Montanha Books? – I’ve workshopped with Janice for many years and I knew this was a good book, a very good book and one which I believed in. It has everything: a stunning setting and a very convincing and humorous protagonist – a woman, Izzie Child’s who’s spent her life studying feminism and women’s studies, has done courses in counselling, is now approaching fifty and yet finds herself worrying about her looks and lusting after a man who cleans the pool of her villa while on holiday in the Algarve. It is intelligent, witty, assertive and hilarious. It has been a great pleasure to edit. – Last question, dear Lisa, tell us about your plans as author and editor. How can an interested author get in touch with you with her/his book-project about Portugal/Algarve? As a writer I hope to publish a novel called Twelve Steps to Separation which is about a thirties Portuguese woman living in London, an alcoholic who hits bottom when she shags her boss, crashes her car and has conversations with an imaginary friend, Gordon. She contacts AA and embarks on a journey without alcohol to lose Gordon and find a new life. Initially she is influenced by her partner, Mark, who is a teacher turned environmentalist whose mission is to save the planet. But on a trip to the Algarve, at an AA meeting, Ana decides to leave Mark and embark on a journey to save herself. – Thank you very much for the Interview, dear Lisa! This entry was tagged Berlin, Lisa Selvidge, Moscow. Bookmark the permalink.